Florida-based five piece Mayday Parade have just released their sixth studio album, Sunnyland via Rise Records. This album showcases the band’s easily recognisable pop-punk sound, as well as their gentler side. ‘Never Sure’ opens the album in classic Mayday Parade style, with Derek Sanders’ signature vocal and a solid rhythm section married with raw distorted guitars. The chorus is catchy, yet the lyrical features of this song seem to be nothing new. Despite this, it’s a good song and an attention-grabbing way to open the album. With its subdued guitars and more delicate nature, ‘Piece of Your Heart’ gives the impression of being a heartfelt love song. Drums, keys, and multiple guitar tracks are introduced in a staggered manner, giving growth and depth to the song. As always, the track features punchy drums and clever lyrics, but Sanders delivers the words with a tenderness that creates something simply stunning. ‘Is Nowhere’ is a track that starkly contrasts ‘Piece of Your Heart’. The droning guitars and harsher vocals, alongside a faster tempo bring things back to the Mayday Parade’s usual style. Various electronic elements and gentle keys at the end capture attention and hint at the experimentation and varying influences that can be heard throughout the thirteen tracks. Another slow opener is ‘Stay the Same’. The steady guitar quickly takes a different direction and punchy drums keep time. Derek Sanders has explained that the lyrics speak of “growing up, watching everything in your life change, and longing for simpler times”. There are hints of punk and heavier rock music in this track, and the growth in the music from start to end keeps attention from diverting. ‘How Do You Like Me Now’ opens with a buzzing guitar riff before exploding into a very classic Mayday Parade track. The chorus is one that will have thousands singing along, yet there are electronic elements that show a new direction for the band. Sanders proves his vocal to be incredibly adaptable with this track, with his well-written lyrics heard clearly alongside the other components of the song. A perfect combination of ambience and honest lyrics is ‘Looks Red, Tastes Blue’. The slower tempo and layering of both instruments and vocals, coupled with the reverb effects creates a stunning atmosphere. Closing the album is the title track, ‘Sunnyland’. It’s another stunning stripped back song, with emotional lyrics that many will understand and relate to. Each aspect has been perfectly produced, from the gentle guitar, to the varying vocal tracks. 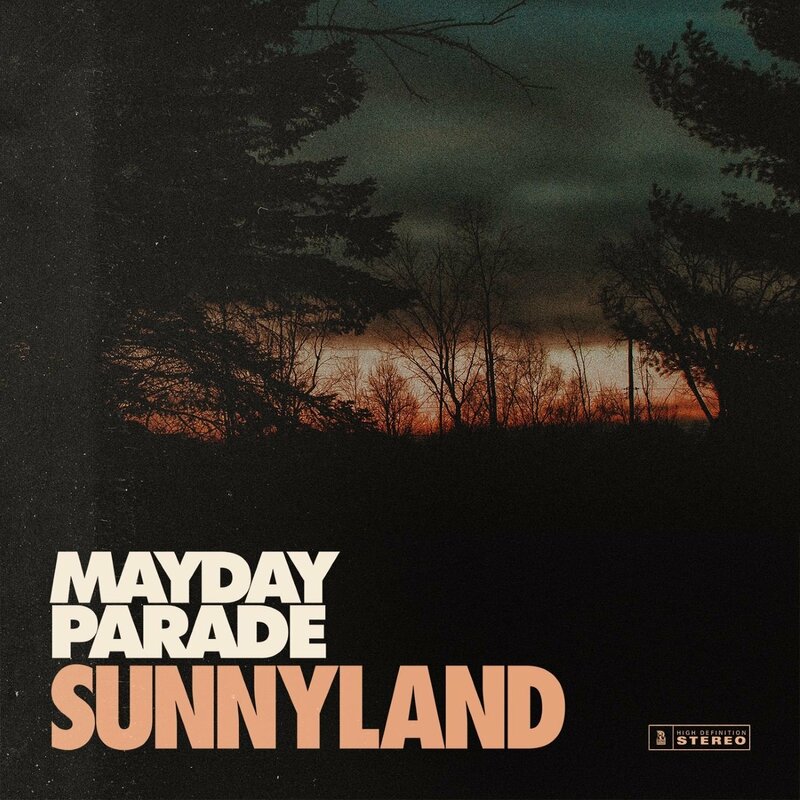 Sunnyland shows just how much Mayday Parade have grown as a band in their years together, and they’ve produced a deeply personal and beautiful track. As a whole, Sunnyland has two themes running through it; there’s the typical pop-punk sound that fans know and love, and the mature and heartfelt side shown in the acoustic tracks. We see growth and experimentation in the thirteen songs released, and clearly each one is there for a reason. Three years without a release may be a long time for some bands, but Sunnyland is an album that was worth the wait.